Photograph: Erica Gannett Radiohead at Lollapalooza 2008. 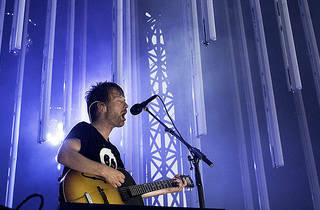 Ever since Coachella 2012, Los Angeles has been anxiously pining for Radiohead to return to Southern California. Sure, Thom Yorke's band, Atoms for Peace, had its secret show in LA a few years back, but we're probably going to get ridiculed just for mentioning that as a consolation. Thankfully, our prayers have been answered: the band will play two nights at the Shrine Auditorium.